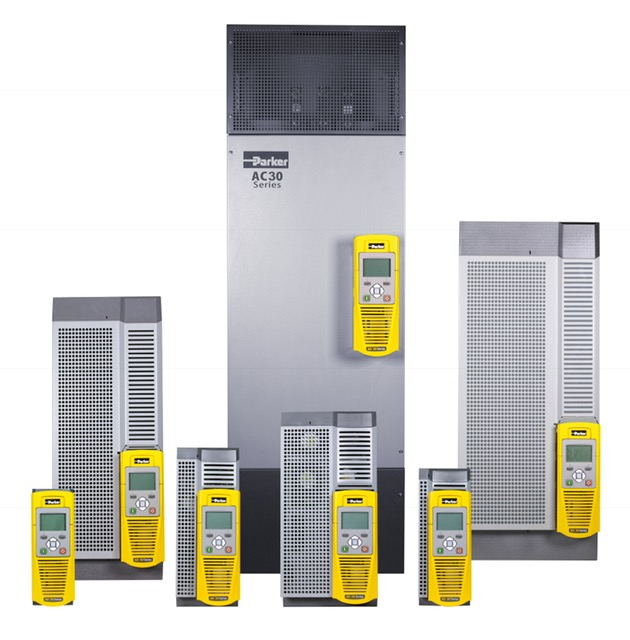 The AC30 variable speed drive range has been designed to provide users with exceptional levels of control, from simple open-loop pumps and fans through to closed-loop process line applications. Its flexible and highly modular construction enables a wide range of communications and I/O modules to be easily added as required. The AC30 has been designed with simplicity in mind, but this doesn’t compromise its functionality. Integrated macros for a range of applications and PLC functionality enable more capable users to create sophisticated control that would previously have required a separate PLC. Designed for operation in environment class 3C3 and 3C4 for Hydrogen Sulphide (H2S) as standard (tested at 25 ppm for 1200 hours), temperatures up to 50 °C with optional integrated EMC filter to C2 1st environment and DC link choke to reduce line harmonics. AC30 also complies with RoHS substance restrictions in accordance with EC Directive 2011/65/EU. Note: AC30 power stacks and interchangeable control modules are available as separate componenets, offering advanced levels of automation control and greater design flexibility – see the “AC30 Series [Power Modules]” and “AC30 Series [Control Modules]” pages in the recommended products section for more details.